It was awful nice having a good shower this morning. Another cloudless day. Joan walked around the park early this morning and did it alone. Bob and Karen came in this morning and we got to comparing hot water heaters. After a good look at ours we went over for a look at theirs. Theirs appears to be gas only and without an anode. Rather strange and we must study that one. Karen and Joan went for another walk. Joan dropped her pedometer so they probably want to see if it still works. Campground life. It gets no better. Joan's pedometer works fine. It just rattles but they made 2.77 miles on the walk. This is Joan and Karen's fruit haul this morning. One of the local experts claim it has been too dry for the oranges to amount to anything. 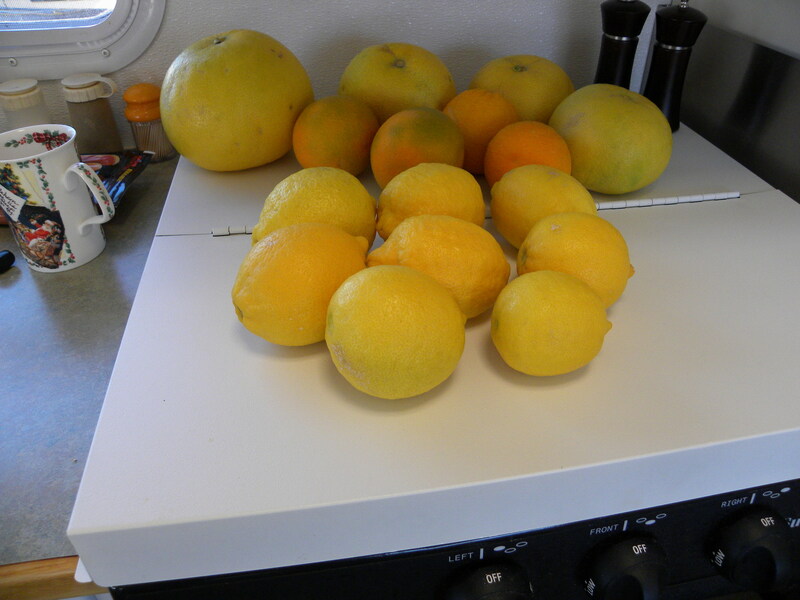 There was no rain last summer so the oranges are not as big as they should be. They are normally the size of a normal grapefruit. 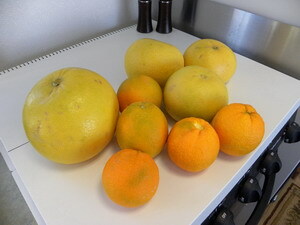 Most of the grapefruit are small as well. One can see this in the photograph. They still look good and taste good to us. This is a photograph after the second fruit haul that includes eight lemons. If this does not produce a great lemon pie nothing will. The guy who owns the lemon tree was talking to Karen and Joan and said he would hang some lemons for them over the wall in a bag. Yes, they were given the fruit. They did not steal it. This is the lemon tree that produced the lemons. The white strip on the right is the back of our trailer. 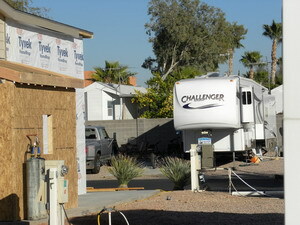 The Challenger trailer belongs to Ian and Debbie from Edmonton, Alberta. The tree to the left of their trailer is the lemon tree. Note all the yellow lemons on the tree. A lemon tree smells very good. The Lemon Tree Bar in Kingston, Jamaica, has a lemon tree growing in it. When in bloom a lemon tree smells very good. Debbie's father was in the Air Force and she lived at the Greenwood Air Base in Nova Scotia for several years. Bob and Karen's hot water heater is an Atwood with a fibreglass tank and gas only. Ours is a Suburban SW6 with a steel tank. Therefore, ours requires the anode and theirs does not require one. Amazing the detail one learns around a campground. The hot water must be heated before entering a fibreglass tank one would think. We are now getting very technical and we have no idea what we are talking about. If one wants to see a true Grasshopper aircraft in true Grasshopper colours bring up either G-AKAZ or G-RRSR in Google. The photographs that come up are copyrighted so we will not use them. Besides it is just as easy to bring them up at your end then one can get any number of photographs and lots of detail. These two are in the colour one expects them to be and the white stripes indicate the D day invasion. The Taylorcraft and Piper J3 was more or less the same aircraft. These aircraft have an interesting history. One can still buy a new one in the form of the Piper Super Cub. A new Super Cub will cost over one hundred thousand dollars the last time we checked. We did our evening run to the dumpster and picked up the mail. There must be one heck of a party on in Coyoteland. You can hear them all around the outskirts of the park. There was some cloud cover this evening but nothing serious. There was a strange sounding aircraft going over that is hard to describe. At least we have never heard the like of it. Whatever it was it was small and slow and fixed wing. That was the day. Another interesting one to say the least.